Saitom and TNSK have teamed up once again with their third book in the series Chroma of Girls titled Jewelic Princess Girls. The two artists each contribute four illustrations and a cover to this princess collection, bringing a very unique style to the theme. 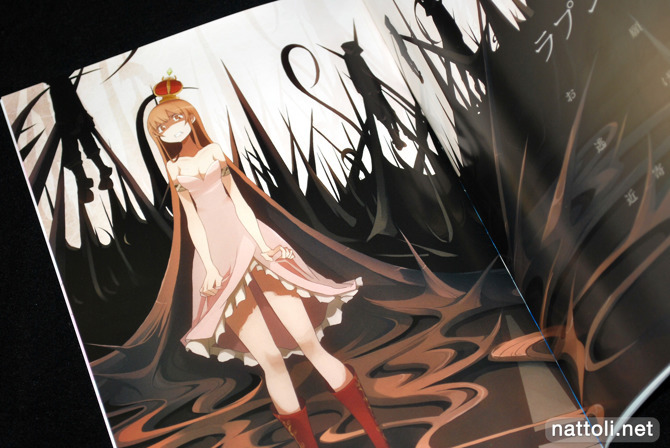 Jewelic Princess Girls is B5-sized and 20-pages counting the covers. This is another collection where, depending on which side you come in on, you would be browsing a different artist. Though based on the page numbering, TNSK's cover is the 'official' front cover. 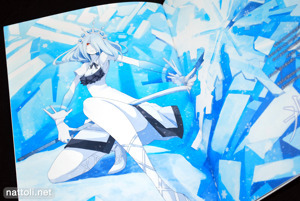 Both cover illustrations are re-used inside the book as a spread with a table of contents pertaining to the artists' side. Saitom, whose steady improvement in art work I found especially impressive in the recent Moeru iPhone Reader creates an armored princess regime which looks half girl, half-machine. The round faces are much more traditionally cute than TNSK's, but Saitom still knows how to find beauty in ugliness, with a masked, almost cyborg-skull version of his cover girl, Snow White. With great thanks to the creativity in theme, Jewelic Princess Girls mangages to brings us a new look at princesses from the uncommon views of TNSK and Saitom.